Well I am all packed up and ready to go! I will be heading out for 3.5 days to hang out on the AT in North Georgia with a couple of buds! What more could I ask for? Yesterday I posted about the food that I will be bringing with me on the trip. Today I just wanted to do a quick video to show the gear that I will be carrying. There is quite a bit of new gear that I am taking so this should be quite fun! Also, my weight for this trip is the lowest it has ever been, and this is my “winter” gear (keep in mind, this is the Southeast ~ however, if you are curious, this will keep me good to right at single digits). This is a total starting pack weight of 275.2 oz or 17.2 lbs. This is the weight that my pack will start out at. However, my MicroSpikes are figured into this weight. Depending on what the weather is doing will determine if they ride in my pack or on my feet. If they start on my feet, my pack weight will be 259.6 oz or 16.2 lbs starting out. As well, the above weights include all of my consumables (food, water, fuel, meds, and even my consumable pencil… 🙂 ) Also, my Multipack will start out at 30.4 oz, or 1.9 lbs. This includes the typical items in the Multipack as well as snacks and lunch for the first day. So, anyway, here is a little video that I put together that shows where everything goes on/in my pack. Hope you enjoy! This entry was posted in Gear, Packing and tagged Backpacking, Gear, Hiking, Packing a backpack. Bookmark the permalink. I notice you have a pack cover AND a cuben dry-bag pack liner AND cuben stuff sacks inside that. I use something similar but I hike the north pacific raincoasts where we measure rainfall per month by the yard. How does the pack cover earn it’s place in your kit? Thanks for the blog and everything else too. Anyway, I will admit, we probably don’t get near the amount of rain as you do, but we can still have our moments. As for me though, I like to make sure I will have something dry, and especially in the winter. However, the rain cover is moreso to help keep the items in my front pocket dry when raining since I do store items in there. As well, it will also help reduce some of the water from seeping into all those tiny seams along the front and top of the backpack, however, the seams on the back are still exposed, which is why I also had the pack liner. As far as the stuff sacks, those are not water proof since water can easily seep into the top opening, as well as the seams since these are sewn. Very comfy! No pain/soreness no where. I love it! It went great! Quickly, everything performed perfectly! I don’t think that I could’ve asked for better and I so feel like I have exactly what I want. When I walked into Mountain Crossings I honestly did not feel like I wanted anything! I’m still planning on sneaking 20 lbs to your pack. : ) This weekend was awesome, can’t wait to do it again! Hahahaha… 🙂 I see that you found my blog. Anyway, glad that you came with us. It was fun. And I think that I would have noticed the 20 lbs… 🙂 Looking forward to doing it again! I have the pics up on my FaceBook page as well as on Picasa. I am currently uploading the YouTube vids. Since it is restricted to 15 minute videos, it will be at least 4 vids. Although, a lot of it is simply me talking about the gear… I should have a trip report up tonight or tomorrow though. Chad, If you haven’t left already try to notice how well the pack transfers the weight to your waist. I’ve been considering the Exo with the external frame for better weight transfer. Weight on my shoulders really wears be down on the trail. Now that you have the 30, do you think that your 17lb setup would fit in the Blast 22 instead? I’m getting close to a 10lb base for solo overnights in the summer and have been eyeing the 22, an equivalent sized Zero, and a MLD Prophet. I’ve read on the BPL forums that a Neoair is warmer with a ccf pad on top. I use a small section of Z-rest under mine for protection but should remember that I can put it on top instead for additional warmth when needed. I will be getting a Zero in a size small to use as my summer pack. At the moment I simply plan to add a front pocket and that is it. I will also use my Multipack with it. I still think that I made a good decision with the 30 for my winter gear. With this size I can still add more food if I need to. A 22 would probably work for what I have, but it wouldn’t allow me that little extra room. Concerning the ccf pad, I have found that for me it works much better on top of the Neo whenever more insulation is needed, however, there are some that like to use it under the Neo. So, it looks like it varies from person to person. Don’t know if this it too late or not, but just to let you know we are getting snow up in the mountains right now! From what I’ve been able to find out it’s pretty much just .5-1″ for most places. No idea if it’ll still be there when you get there or not since the ground hasn’t frozen really yet this year. The temps are supposed to hold above 20 degrees throughout the state so you’re set up should do ya good. Have a great trip! Thanks Joslyn. I always appreciate an accurate weather report. The Weather Channel is usually not quite right… :)Anyway, sounds like just about right hiking weather… Can’t wait for the morning! I am pumped for ya man………….GA is fun wish it had some switch-backs though hahaha…….for what its worth NC does………..and its something to look forward to……hooe you have an awesome trip man!!!!!! I don’t see any camp shoes on your list. You will appreciate them at camp especially if your feet get wet. I always bring a couple extra carabiners too. How do you attach the multipack to the shoulder straps? I actually gave up on camp shoes a long time ago. For me I felt like they were useless weight. I have never found myself uncomfortable wearing my boots, or trail runners in camp and wishing for a different pair. I guess it helps that my feet do not seem like they sweat much at all too. I am sure they stink, but they hardly feel overheated. And for winter I like to have my warm boots to keep my toes in until I crawl in bed… There is the possibility that my feet will get wet, but so far so good. My boots are full-grain leather uppers and has a GTX liner, and while I am not saying that these are bomb proof, they are quite well at doing there job, so I feel secure in them staying dry. As for carabiners, I carry one with my bear bag system and one extra. I also have 4 zip ties in my ditty bag. The Multipack attaches to the backpack with some small clips similar to those usually found on the hip belt buckle. The small clips are attached to the daisy chain on my shoulder straps high up top via some thin, lightweight (0.4 oz/pair) webbing. I leave these buckles attached to the shoulder straps at all time. I will be sure to include some more on the Multipack while on the trail though. There are a few different ways to attach it to the pack (it is designed to be a top lid for a pack, a fanny pack, can be worn slung over a shoulder and of course the way I am wearing it attached to the front of the pack). I hiked Springer to Winding Stair Gap last August. Fantastic trip. It had been dry for some time in the area and not much water to be had. Don’t pass up any chance to get water. I always camel up(drink all of my water and refill my bottles) at the water holes. I used Aqua Mira but see you have a filter. Have a good time, I’m jealous. I actually am a huge fan of Aqua Mira. The filter that you see here is the AM Frontier Pro filter which is not a stand alone filter. It will only filter down to 3 microns which means it won’t touch anything except Crypto & Giardia. Like I said, I love my Aqua Mira. After deciding that I wasn’t happy with all the hoses and balancing-acts with my hiekr Pro filter I went to AM drops and have been a happy camper since. However, in my quest to go lighter, I picked up some of the MP1 tabs. And then the gear nut in me decided that for 1.8 oz the Frontier Pro filter was a nice addition. Now with using both of them I have no worries. Just drop the tablets (or the drops) in and wait 15 – 20 minutes and then filter through the Frontier pro. Once this is done everything is gone from the water! It is not a bad system at all. I don’t think that there is anything wrong at all with just using the drops or the tabs (other than the tabs leave an awful taste), but at only 1.8 oz it is well worth the added protection, IMO. Fantastic video buddy, you just made a lot of backpackers jealous for sure. I could only wish to have that kind of weight. Don’t know if it’s needed or not, but have you thought about hanging your food (not sure if bear are still out or not) it’s been pretty warm until this week. Don’t know if you can hang the bag your food is in or not or did you even bring a section of rope to do that….just a thought. Have a good hike, will be watching for a report. And yes, I do have everything I need for a bear line. My bear kit consists of my large blast food bag (the blue one that everything is in), 50′ ZLine Slick Dyneema Cord, a mini-carabiner and a MYOG rock bag. It all weighs in at 1.7 oz! (I actually have a post on my bear bag kit somewhere here on my blog.) Anyway, the bear bag kit is listed under Essentials on my main gear list. Although, we will be camping at shelters along the AT so there will also be bear cables near the areas we will be camping at. Man oh man do you have an awesome looking setup!!! 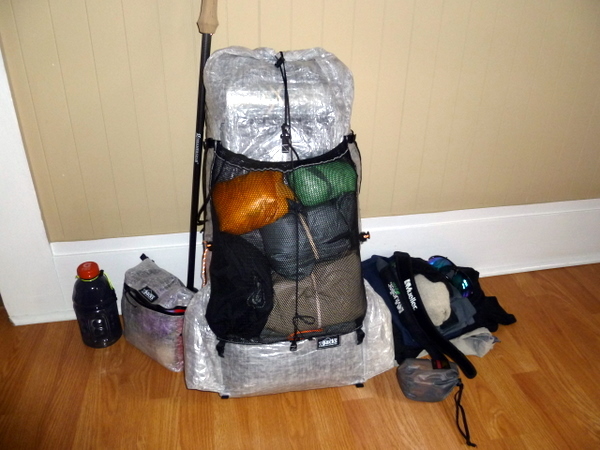 That is a back setup that any hiker would love to have – awesome job putting all of that together! That Blast 30 should handle 17 pounds very very well. Hope it works out for you. Did you say you put your ccf sleeping pad on top of your neoair? I usually put mine underneath it… never even thought about putting it on top. Guess I usually put mine underneath to help protect the neoair, but with the cf ground sheet you would not need to worry about that, huh. Hmm, guess I know what I am going to be trying out tonight. I almost pulled the trigger and bought a Marmot Helium today. Does it keep you warm at 20(f) with no base layer clothing, or do you find you have to put on some layers to stay warm at 20 and under? Of course though if I do get to get a Zero pack for summer, I will probably use the 1/8″ pad in the same manner as I am using the 1/4″ pad in the Blast pack. So, in this case I will probably use the ccf pad at night under the Neo simply because I won’t need it for extra insulation and in turn it can serve as extra protection. Thanks John for checking it out!